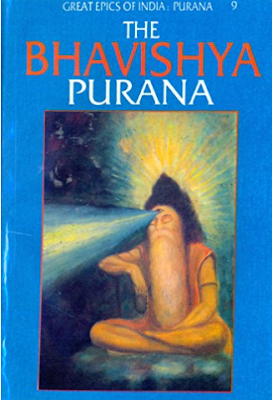 This is a unique Purana as it gives very different views of Brahma in it. It says that Brahma is the greatest god as he creates, preserves and destroys the world. I found this very different as most Purana says that Brahma is the creator, Vishnu is the preserver and Shiva is the destroyer. After creating the world, Brahma found that the people became too self-confident, proud and arrogant so he decided to make a god who everyone would have to pray to at the start of any journey and devote their success to him. Can you guess who he made? He made the god Ganesha! I was so surprised when I read this as I had never heard of this creation of Ganesha. This was a very different Purana as even though it is a rajsik purana it mentions that Surya is the most important god. This Purana had very few stories as most of it was about vratas(fasts), dana, temples and the different dynasties. They took up pages and pages leaving space for only two to three stories. It also talked a lot about the future because the title of the Purana is Bhavishya which basically means future. However, these retellings were not that boring because they also taught me many new things. I liked the part about vratas. Vratas or fasts purify oneself. They also give us a lot of punya. We can also save loved ones from going to hell through our store of punya which we get by performing vratas. One such example is the story of a lady named Shyamala. There once lived a woman named Urmila who had a son and a daughter. She lived in Mithila and was very poor. She could barely make ends meet. She decided to shift to another city so she went to Avanti with her children. Urmila worked at a brahmana’s house in Avanti. One day her children were very hungry so she stole some food grains from the brahmana’s house. Soon her daughter, Shyamala grew up and was married to Yama. She was allowed to roam anywhere in Yama’s palace except for seven rooms that were always locked and out of bounds. Urmila had died by then. Once out of curiosity she opened the door and a horrible sight met her eyes. Her mother was being forced into a cauldron of boiling oil. The second door showed her mother being crushed by a grinding stone. The 3rd, 4th, 5th, 6th and 7th doors showed terrible sights as well. Shyamala was shocked. She demanded an explanation from her husband. Yama explained that Urmila had stolen from her master a brahmana which was a grievous sin. Shyamala asked Yama if there was any redemption for her mother. Yama said that in her previous birth she had performed the Buddhashtami vrata 8 times. That punya was still with her so if she transferred that punya to her mother she could be redeemed. Shyamala did as asked and her mother was saved. This is the wonderful effect of performing vratas. The Buddhashtami vrata is only one vrata. There are 32 different types of vratas for Surya and 17 different types of vratas for the other gods. Think of how much punya that would add up to. There are also 20 different types of daan mentioned in the Purana which also give a lot of punya to the donator. There is a lot more in the Purana but why don’t you read it yourself and find the different ways to obtain punya in this kali yuga where evil reigns.